Wincorp Solutions – The Right People at the Right Time. The Right People at the Right Time. Value-Added Solutions for Workforce Challenges. Disrupting talent delivery with a faster, leaner, and smarter approach. Demand for talent has become more specialized and recruiting for professionals has become more nuanced and niche. Our clients’ products and services have become more specific. Therefore, today’s era requires innovative recruitment and staffing services that integrate seamlessly into clients’ skill set needs and corporate culture. Big box staffing and one-size-fits-all doesn’t work well in this era. We’re not big box or a B2B or B2C company, but proudly a B2P company (Business-to-people). We’re a people company efficiently designed and technologically advanced to leverage our Expertise, Efficiency and Results Orientation, with a high human touch to clients and our teammates. Holistically, it all goes hand-in-hand. Companies and/or their MSPs are realizing that their current supply base lacks the ability to intelligently source niche professionals such as accountants, underwriters, financial business intelligence analysts, digital marketing experts, and others. We specialize in filling difficult positions with rapid response times. We adhere to program and onboarding compliance standards. We contain costs for clients without a degradation in quality or delivery. Our teammates are sharp, our consultative approach provides expert insights on the entire process. From mid-level searches to executive level placements, results matter. We deliver. The collective 200+ years of our management team brings expertise that excel at search. Most corporate recruitment teams can’t support every key search due to time pressures, investment in resources and overwhelming day-to-day activities. This is what we do, it’s our focus, it’s where we thrive. Client hiring misfires are detrimental to both client shareholders and the candidates’ careers. Choosing WinCorp Solutions brings you “well connected” specialists and our large networks of talent pools and recruiting capabilities, collective years of subject matter expertise combined with executive recruiters who have cut their teeth at FORTUNE 500 and the largest Executive Search Placement firms. Choosing WinCorp Solutions reduces the heavy burdens and pressures from all parties, including new ownership, investors/private equity, board of directors, senior leadership, human resources. Choosing us allows clients to take the “sharpshooter” approach to zero in on finding those non publicized candidates, sometimes the best individuals in the hidden marketplace. Our multi-stage process screens for skills and vets for culture fit. Choosing us liberates your day-to-day operations. Presentation of candidates, and if needed, management reports and KPI updates are easily provided to reduce all client burdens. We have experienced recruiters that are experts who bring a wealth of past industry and organizational experience to the process. Our teammates have worked with a variety of hiring managers, across industries and job categories. We’re also a very likable organization and work as an extension that seamlessly integrates into our clients’ needs. Our third division is the Consulting, Project-based Statement of Work (SOW) division. Servicing interim consulting, gap fill, or large project engagements can be high priority for clients, either directly or through their Managed Service Providers (MSPs). Scoping engagements are intricate and sometimes challenging undertakings. The SOW services category can be complex. 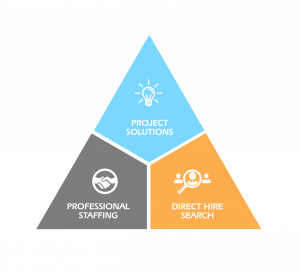 Traditional staffing only firms have trouble having a stable of key talent or are unequipped to identify talent needed for project solutions. WinCorp Solutions is not the typical supplier. We’re a partner in the process and a smart alternative and/or complementary offering to Big 4 CPA Management Consulting firms or large enterprise management consulting companies. WinCorp Solutions will provide a high-touch talent augmentation strategy by a firm accustomed to sourcing highly competent consultants with niche skill sets. We collaborate with project leaders to draft statements of work that ensure conformity and clarity over the scope, clauses, deliverables, budgets, timelines, performance expectations, rates and negotiation cycle times. WinCorp Solutions aligns with project leaders into the program as partners, not opponents. We centralize visibility for all project related activities and rein in maverick spend from procurement purchases made by internal client managers. Our Project Solutions client engagements have included the largest multi-national enterprises in the Utilities, Financial Services, Manufacturing, Entertainment, Development and Hospitality/Retail industry. WinCorp Solutions supports current and future state assessments, gap analyses, capability evaluations, process design and cost savings modeling. Evaluate and compare our enterprise offerings and the consultation will valuable in your selection decision process. We expedite reporting, electronic budget approvals, deliverables, invoicing and SOW amendments. We can utilize existing VMS, ERP or other systems in place to ensure consistency in communications and transparency into milestones, budget adherence, rates, schedules and more. We validate the proper classification of contractors and freelancers. We further support these efforts by organizing compliant and comprehensive onboarding initiatives for all talent involved in the project — even remote workers, who may have access to systems or intellectual property. Copyright © 2019 WinCorp Solutions.